View of The Honeycombs from the Weiss Highway looking to the north-northwest. The Honeycombs include one large elongate and irregularly shaped hill (right) and one small, circular hill (far left), unofficially named “Big Honeycomb Hill” and “Bell Hill,” respectively. The hills are the erosional remnant of a single lava dome. Far out in Utah’s west desert, 25 miles from the Nevada border, is a solitary cluster of hills called The Honeycombs, also known as the Honeycomb Hills. Rising just a few hundred feet above the surrounding landscape, the humble Honeycombs are overshadowed by neighboring Great Basin mountain ranges. The hills barely draw notice, until examined up close. Their rough and craggy rocks—mostly gray but also red, orange, lavender, and pink—are permeated with hollows ranging from pea-sized pits to alcoves large enough to shelter a horse and rider. The pattern of the hollows and the thin walls that separate them resemble the hexagonal cellular structures of beehives that give The Honeycombs their name. The distinctive appearance of the rocks at The Honeycombs results from a process known as honeycomb weathering, also called cavernous or alveolar weathering. 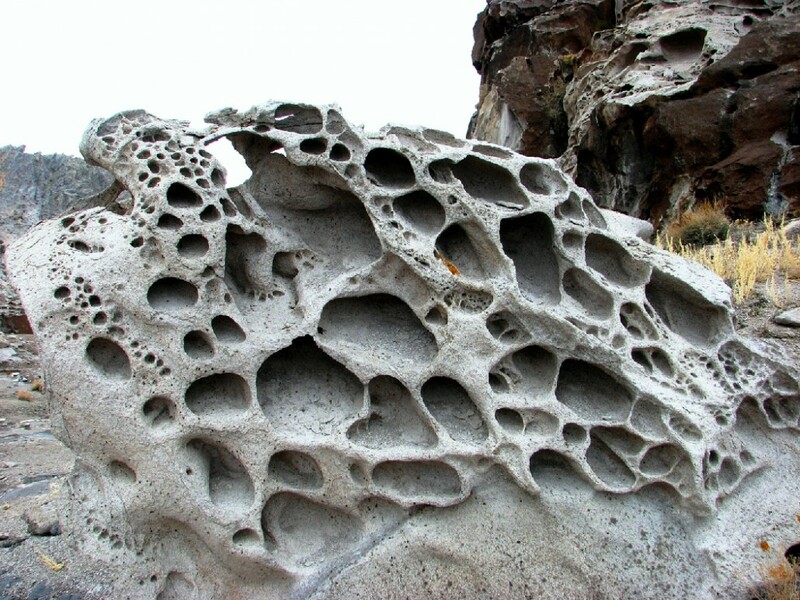 This type of weathering produces rock riddled with cavities known as tafoni, giving the rock a texture described as lace rock, stone fretwork, or stone lattice. Pitting in the stone can be nested—smaller cavities within larger ones that are themselves within larger ones. This type of weathering is typically found on inclined or vertical rock faces and occurs worldwide at all latitudes. Honeycomb weathering is an especially common feature on cliff faces in deserts and along seacoasts. Honeycomb weathering is likely a combination of physical and biological factors. “Salt weathering” is often cited—accounting for the prevalence of the weathering features at ocean and desert locales—by way of pressurization in rock pores from salt crystal growth, hydration, or decay through chemical processes from salts such as halite, gypsum, epsomite, sylvite, and mirabilite. 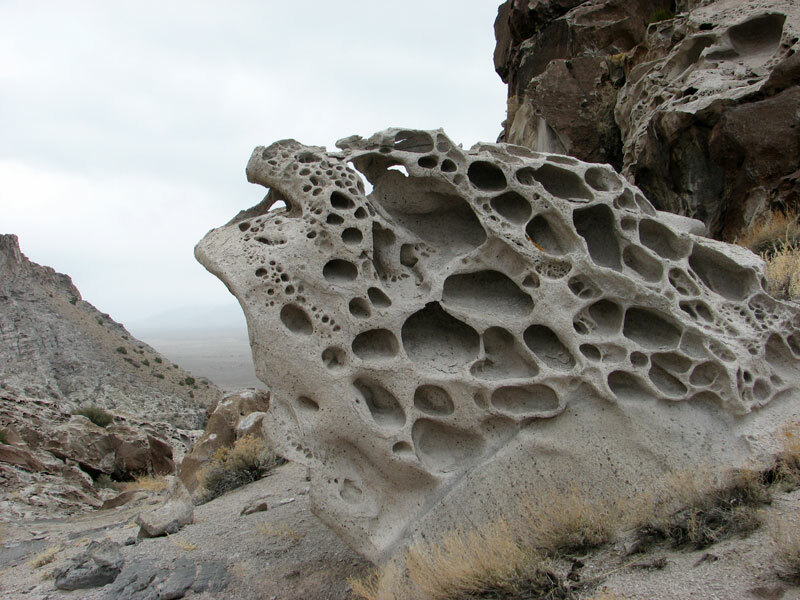 Other mechanisms that contribute to honeycomb features include internal characteristics of the rock such as bedding planes and rock heterogeneity, and external factors such as microclimate (wind and air pressure, humidity, solar radiation, frost action, and thermal stress). Microorganisms such as algae and fungi on the rock and within rock pores protect the thin walls between the cavities and preserve the seemingly delicate tafoni. Honeycomb weathering can develop within a human time frame, emerging and enlarging on rock walls and stone monuments in less than a century. Tafoni features form in a wide variety of rock types, including rhyolite at The Honeycombs, but typically is seen on sandstone and granite. The Honeycombs were created by a volcanic episode 4.7 million years ago. During the eruption, magma oozed upward through limestone and older volcanic rocks, culminating in an explosive eruption of ash and rock fragments followed by lava flows. 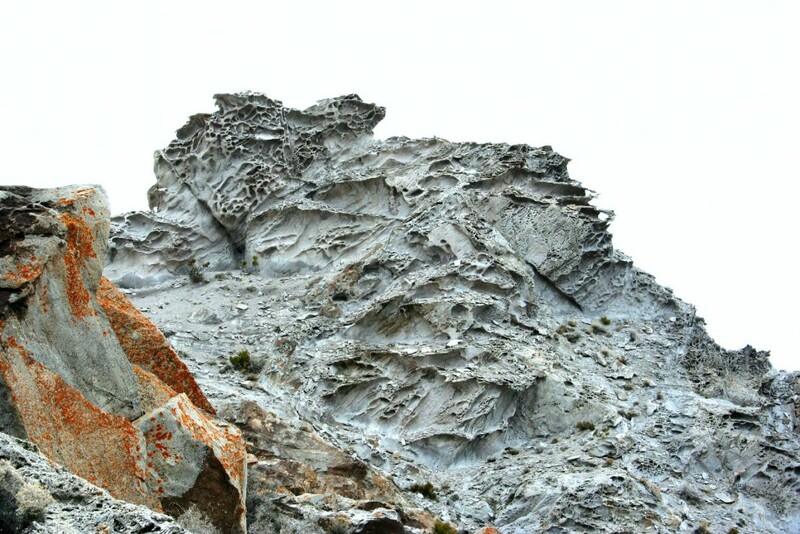 Forty feet of tuff (consolidated ash and other volcanic debris) underlies a lava dome of 200 million cubic yards of topaz-rich rhyolitic lava. The lava dome has since been eroded to form the hills, and the central magma conduit is exposed within The Honeycombs. The Honeycombs are a young component of a swath of volcanism stretching eastward from Nevada through Juab County and into southern Tooele County. 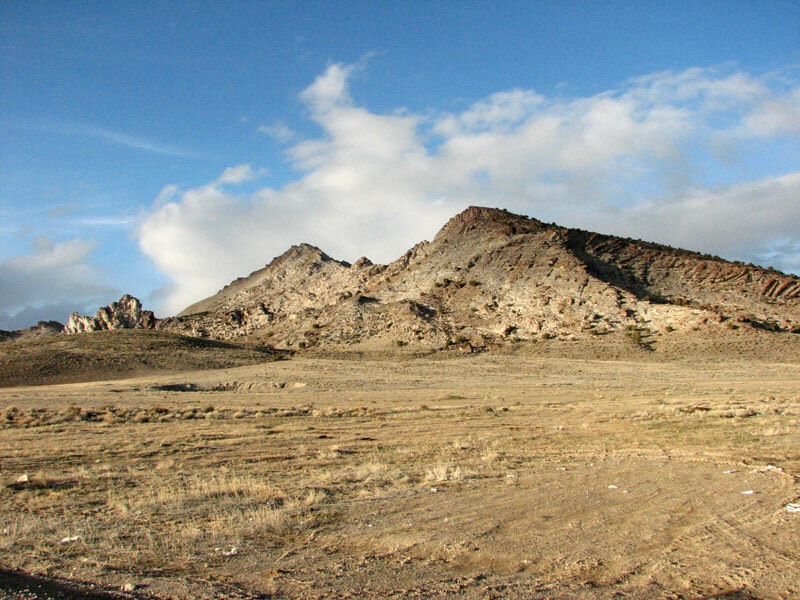 This zone is referred to as the beryllium belt of western Utah (also the Deep Creek–Tintic belt) because of numerous occurrences of beryllium mineralization. The Honeycombs have enticed geologists because of the rock’s distinctive geochemical signature—enriched in elements such as beryllium, fluorine, uranium, tin, rubidium, thorium, cesium, yttrium, and lithium. Since the discovery of beryllium here in the early 1960s, various companies have explored for this metal as well as uranium. In 2010, all mineral claims at The Honeycombs were acquired by the Canada-based gold and rare earth metal company Redhill Resources Corporation. The Honeycombs have been dubbed a “miniature Spor Mountain,” in reference to a mountain of similar origin 20 miles to the east. 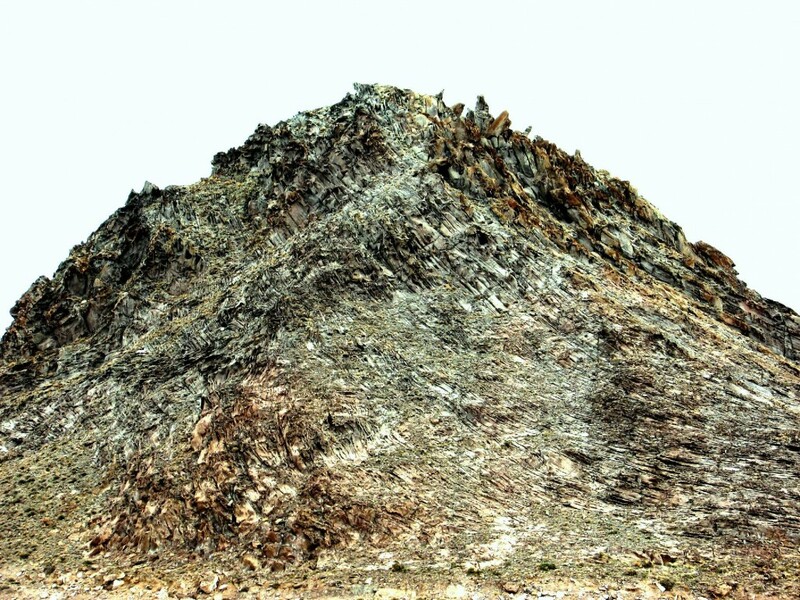 At Spor Mountain, the majority of the world’s beryllium is produced from Earth’s largest known deposit. 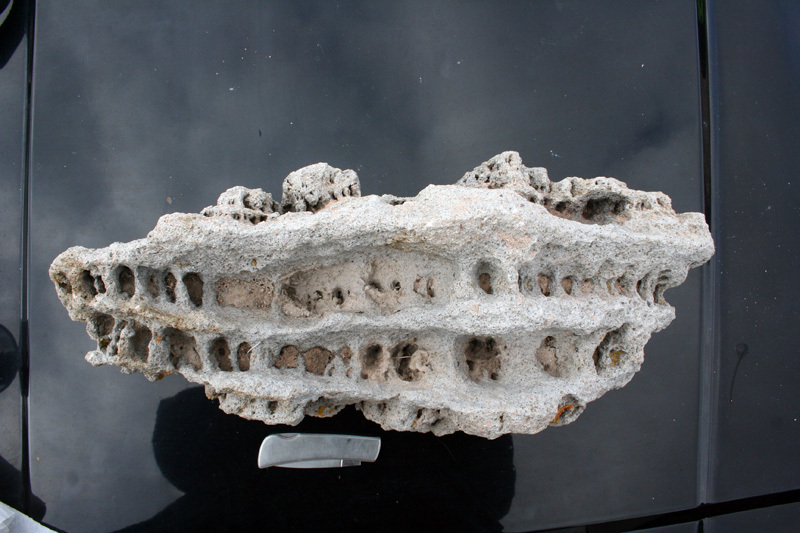 Currently, The Honeycombs are a Bureau of Land Management public community pit for collecting the sought-after lace rock that is desirable for display in aquariums. From U.S. Highway 6 between Delta and Lynndyl, go west on State Route 174 (Brush Highway). After about 41 miles, and about 3½ miles after passing the sign for the Topaz Mountain turnoff, turn left onto a well-graded dirt road (Weiss Highway), which is marked by a sign for Trout Creek, Callao, Gold Hill, and Ibapah. After about 30 miles you will see The Honeycombs, a few hundred feet off to the right (east) of the Weiss Highway. Several dirt roads lead to the hills: the southern road goes around to the back of the hills (east side) and then continues on a few hundred yards as a four-wheel-drive high-clearance road, the middle road goes to the southern side of the hills, and the northern road begins just after passing Bell Hill and ends on the north side of the hills. Be sure to have a full tank of gasoline, food and water, a spare tire, and emergency supplies, as services are distant from The Honeycombs. Contact the Fillmore Bureau of Land Management Field Office for more information and current conditions at (435) 743-3100. Useful Maps: Fish Springs 30′ x 60′ quadrangle (1:100,000 scale), Middle Range North 7.5′ quadrangle (1:24,000 scale).